nipap is a sleek, intuitive and powerful IP address management system built to handle large amounts of IP addresses. Enjoy a pleasant and intuitive web interface user experience. Fairly good documentation, for users and developers alike. This thing was built by network engineers for network engineers because nothing else out there matched our passion for storing IP addresses. Lots of love built-in - guaranteed. Comes with a feature complete CLI for anyone who prefers libreadline to a web browser. Written in the world's most awesomest programming language. There's also a very convenient pynipap library for interfacing with NIPAP from Python. Never again wade through long list of IP addresses for finding the next available one. NIPAP's automagic address allocation functionality quickly gives you the next free address. 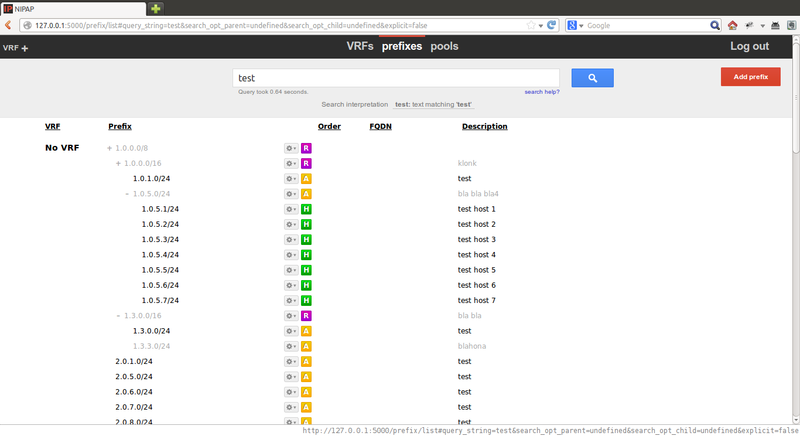 Really great search engine built-in that does what you want. NIPAP understand IP prefixes and has search operators to match on more specific prefixes, covering prefixes and so on. Regular expressions are supported for everything else! NIPAP uses the most advanced open source database on the planet to safely store your data. PostgreSQL offers native storage of IP addresses and super-fast ternary lookups using the ip4r module. NIPAP treats all users, men and women, alike! Java client library for that true enterprise feeling. Integrated statistics helping you lie about your usage to your RIR! Do we even need to mention that IPv6 is supported? 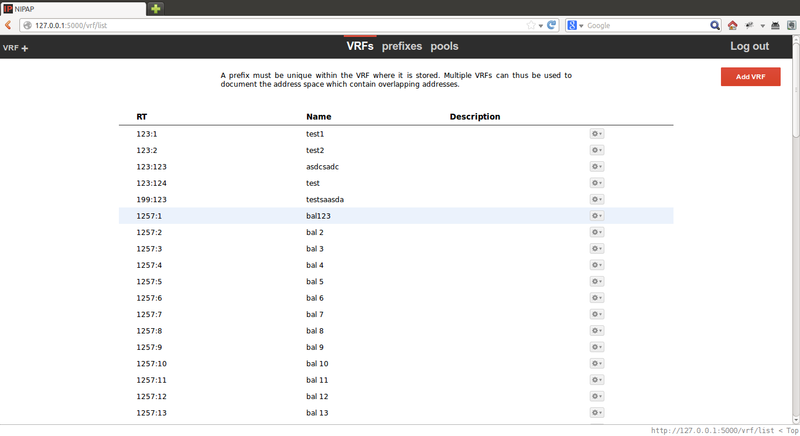 Naturally full feature parity with IPv4! NIPAP is open source under the MIT license. Fork us on GitHub! Check out the demo installation, read some reviews or look at these pretty screenshots. NIPAP is designed from the ground up for VRFs. Prefixes can be conveniently added from address pools. Read the installation guide for getting nipap up and running. NIPAP is the most powerful open-source solution in today's IPAM landscape. NIPAP is a rare and beautiful creature in that it has full feature parity between all its northbound components across all address-families, even in VRF context! The team's modern approach to software development and their focus on long-term manageability, give me the confidence to recommend NIPAP to everyone. We love NIPAP! We went from using a shared Google spreadsheet with very little standardization to an easy to use Web and CLI. Best of all the data is now in a uniform pattern and we can access it via a sane API. NIPAP FTW! DANTE, the operator of Europe's research and education network GEANT, selected NIPAP for a number of key features and has been using NIPAP for some time now. NIPAP allows DANTE's teams to work with a single tool from the definition of the addressing template to its reservation and allocation ensuring a clean and well maintained address space. This cohesive approach is all the more critical when running both IPv4 and IPv6 natively which NIPAP helps to maintain. 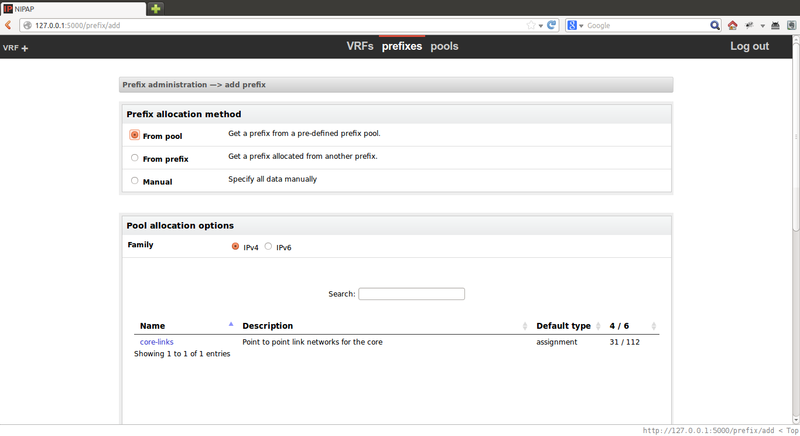 It was all also critical for DANTE to select a tool able to work with Virtual routing instances (VRF). NIPAP is a "no muss, no fuss" tool that is very easy to deploy and DANTE will continue to closely follow future development of the tool with great interest. See the installation guide for instructions on the installing and configuring NIPAP for your environment. User documentation (although rather limited at this time) can be found in the form of a GitBook. Developers are encouraged to read the developer reference documentation. Please use GitHub issues to report bugs, make feature requests or post any other issue you may have. There is also an IRC channel on freenode called #NIPAP. Join if you want to chat!